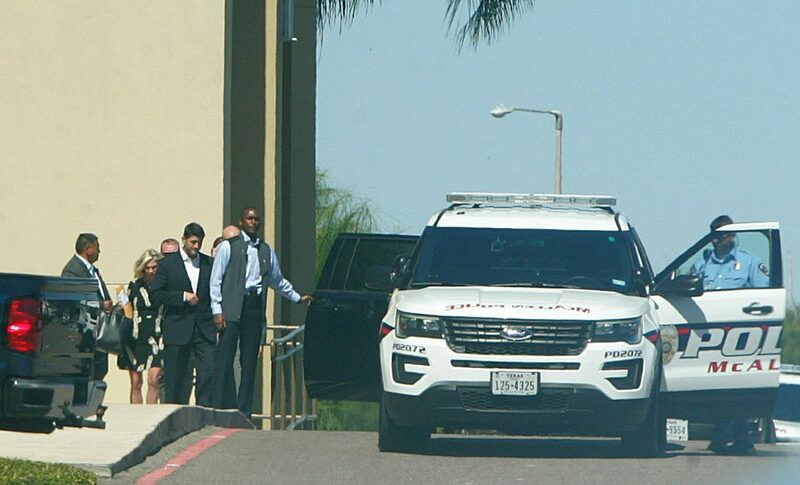 Paul Ryan leaves an event Wednesday, Oct. 18 at the Edinburg Conference Center on the Doctors Hospital at Renaissance campus. Something significant happened Wednesday when U.S. House Speaker Paul Ryan visited the Rio Grande Valley on an hours-long tour: The closest he got to the international border was when he flew into and out of the McAllen airport. Instead, the man who is third in line of succession to the president, spent his time touring the facilities of Doctors Hospital at Renaissance discussing the issue of health care in the Valley. We appreciate the speaker’s willingness to view our region from a policy perspective that doesn’t center on border security and we commend DHR for facilitating Ryan’s second visit to this area this year. We are mindful that Ryan’s first visit to the Valley in February focused almost exclusively on border security. So we are gratified that he saw fit to look at some of the other myriad challenges of our area. We have called on many members of Congress — and several times on the president — to visit our region and see first-hand the unique nature of our Valley culture and the significant public policy challenges. That Ryan has done this very thing gives our region a huge advantage in the ongoing deliberations of Congress because the leader of the lower chamber of Congress at least now has a fundamental understanding of some of our challenges having seen many of them first-hand. We would be naïve to believe that his journey was solely a fact-finding mission. Several people familiar with the visit have told us that the trip included — perhaps was even induced by — fundraising. And while the notion of having to pay to play in our political system is not ideal, and certainly not popular among most of the voting populace, we appreciate that DHR and its stewards understand this game and willingly play it on behalf of the region. Could it potentially mean more revenue for DHR? Almost certainly. But the issue of health care in our current political climate — and especially the issue of healthcare coverage for the poor of which there are many in our region — is extremely important as the landscape constantly shifts and expenses continue to rise. That DHR was able to demonstrate to Speaker Ryan the role of Medicaid in our community; that it was able to give him a tour of DHR’s neonatal intensive care unit — ranked one of the best in the country and provides critical care access to a population that largely is uninsured — is highly significant. Perhaps the most encouraging aspect of Ryan’s tour of the Edinburg facility was his exposure to the topics of graduate medical education funding, the region’s doctor shortage and the significance of a nascent medical school. Several officials who knew of Ryan’s visit privately lamented that this trip meant that Ryan and the Republican Party were the beneficiaries of political dollars in a Democratic stronghold. But we believe this is smart politics on behalf of DHR and its political action committee, the Border Health PAC. At both the state and national levels, Republicans are in charge and the public policy decisions they are implementing are having profound effects on the Rio Grande Valley. Not to communicate with these policymakers in charge is foolhardy and is symptomatic of the many unsolved problems in Washington. That entities such as DHR are forced to cough up money to gain access to people like Ryan is worthy of a discussion unto itself. But studying the issue of health care in our region, which took center stage with one of the most powerful men in Washington, is a far better use of our time.